It may be time to call the Center for Disease Control, because an outbreak of major proportions is immanent in the Seattle area. My fair city could very well be the next Hot Zone, but there is still time to prevent catastrophe if they act soon. If the CDC takes this seriously, they will call in the military for support, have them swoop down on Seattle and the surrounding area immediately, set up an impenetrable quarantine zone, and hope for everyones sake that this thing hasn't gone airborne. All roads will need to be blocked. All ships held in port. All flights grounded without delay. Dare I say anyone attempting to leave the area will have to be dealt with using the harshest of measures. Then, once an impenetrable barrier has been established, they would be wise to call in someone with experience. 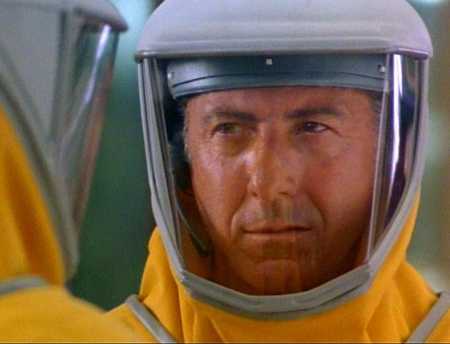 Somebody who has been on the front lines of a major outbreak in the past (I'm thinking Dustin Hoffman or Will Smith, maybe both) hand them giant square-headed orange haz mat suits with extra long hoses attached to the back, and send them walking methodically in the direction of the LIAYF household while making those loud, air suctiony sounds. As they approach, The Fresh Prince and The Rain Man, or whomever is ultimately sent will, depending on the progression of the outbreak, undoubtedly have to maneuver around the scattered bodies laying limp and motionless, many with both hands clutching their midsections, the effects of the outbreak having run its course with them. Then, once inside the LIAYF home they will need to be prepared to use whatever means to find and stifle Patient Zero. I would suggest serious faces, stern looks, or deep breaths targeted directly at the subject. If those don't work, they may have to employ extreme measures - An offer a diversionary treat, or more effectively a story, preferrably from a book with colorful pictures! But again I stress, it's time to act now. Without haste. I'm sounding this warning because I have seen it first hand before and know how quickly it can spread. This 4-year-olds laughter is highly contagious. Honest. They must act now or people won't know what hit them. While Lukas doesn't officially turn the big 04 until Monday, his Superhero birthday party is Saturday. As I mentioned in my previous post, we (and when I say we, I really mean mostly Mrs. LIAYF) have been busy the past couple of weeks planning for the big event, including making nearly 30 capes and masks. The party was a huge success. The weather held out nicely with the sun even making periodic appearances! All 60 plus people who RSVP's, were arrived and had a Super! time, especially the Birthday Boy. We were expecting a block letter L, not cursive. The world is a safer place today! So tell me readers, what are your plans for the weekend? You know, it all starts out so simple. Your wife and you realize that your beloved son has his 4th birthday coming up soon, so you decide to throw a party. Who would deny their little guy that, right? Well, then you tell him about it and since he is going through a big time Superhero worship phase he asks for it to be a themed party. So, Superhero's it becomes. Then, since it is the last week in June, the same time of year when it was 90 degrees F on his first birthday, you decide to have it at a local park. And, as a bonus, the wading pool there opens that same morning. Then, while you are making out the guest list you feel really bad about leaving some of his preschool friends off the list, so you invite them. At first it seems like no big deal, even though there are 30 kids in his class, because after all it is Summer, right? People have plans. But then amazingly everyone, with the exception of 3 kids, RSVP's! This results in a guest list of well over 60 people, over 30 of which are 3 and 4-year-olds. And since your lovely and clearly amazing wife is making a Superhero cape and mask for each and every one of them out of adult T-shirts, you realize that you need to go back to the thrift store and find more shirts! Of course, you still have to feed all of these people, so together you order a huge cake and buy a ton drinks and dogs to grill and graciously ask attendees to bring a side dish. You will, however, still have to get to the party site early to decorate and set up, so you enlist the services of your favorite sitter that morning so you have an extra set of hands. You stay up late working on logistics, cutting things out, and worrying a bit about whether you are planning enough 'activities'. Then, when you are finally able to take a breath, and you feel that everything seems to be in order for the day of the party, you take another gander at the weather forecast for the day of the party. And you cross your fingers. Yes, it all starts out so simple. Yes I Swear, It's the Truth. I mentioned in a earlier post that we had signed Lukas up for swimming lessons at our local community center. 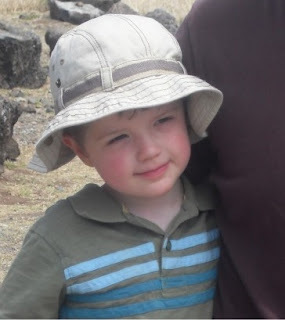 We had actually only participated in about 5 lessons before our much needed vacation to Hawaii last month but he was doing well, swimmingly, in those classes - picking things up a amazingly well. However, while we were gone on vacation the class ended. And then there was the actual vacation, the getting home and settled back in, and back into a frame of mind to once again leave early from work a couple of nights a week to get him to the class. The culmination of all those factors led to a month long hiatus from swimming lessons for Lukas which ended last night when he and I once again attended a class together. I say together because for these lessons I am in the pool with him. It's actually called a 'Tot' class, but the kids can actually be up to 4 years old. Since we had never enrolled him in lessons before we decided to for this option rather than a 3 year old class where he would hang by himself on the edge of the pool while he waited for an instructor to filter through other kids for his turn. For the next session after this one though, I will unfortunately have to sit it out as he will be 4 and participating with him won't be an option. I have to say I will really miss being in the class with him as it has been quite a bit of fun. You may also recall from that earlier post that our son had a bit of an issue with his locker room talk. I am happy to report that this has not been an issue since *Cough* family changing room *Cough*, and that Lukas picked up where he left off during his hiatus like a champ. Better than could be expected really. It was pretty amazing to be there participating with him actually, as in the short half hour he was floating on his back and kicking his legs almost clear across the width of the pool while I had barely a few fingers supporting his back. This in only his 6 lesson, and first after a month delay. This just reinforces what we have seen in the other games and activities he has participated in. Lukas has some real natural athletic ability. We will certainly be fostering those abilities as he gets older as it will be a great way to keep him active and healthy. That half hour also provided the two of us plenty of opportunities to work on his jumping into the water as I must have lifted him up out of the pool nearly 20 times, only to have him jump right back into my waiting arms. In fact, he was getting so good at this by the time the class ended that on what was nearly the last jump, while I was in water up to my shoulders, he spread his arms out to his sides and jumped straight out and nearly over my head. But at the last minute I reached back over my head and caught his torso with my arms stretched high overhead. What resulted was nothing short of the classic Swayze catch of Baby in that icon Dirty Dancing scene. Mrs. LIAYF, along with a whole family who were sitting next to her in the stands witnessed this with what I am suspecting was utter amazement. Me? I simply closed my eyes while holding him there above me and tilted my head back with with my mouth open just so. Yeah, I was having the time of my life. Something unprecedented happened with Lukas and the LIAYF crew on Sunday. It was a milestone of sorts, but Mrs. LIAYF and I are not yet sure whether this is a good thing or not. It's a thing that was bound to happen on it's own in time. Most likely sooner rather than later. But we can't attribute this particular instance to Lukas getting older. That's because we, Mrs. LIAYF and I, decided to make it so. The 'it' I am referring to is Lukas' first real day without a mid-day nap. His mother and I have been extremely diligent about making sure our son has the opportunity to catch a few refreshing Z's in the middle of each day. Most often that involves planning our weekend and vacation days around when we can put him down for his nap, which can make our options rather limiting. On more rare occasions he gets his nap in the car, but always there has been that opportunity. And he has taken full advantage of those opportunities. Just shy of his 4th birthday, he still will sleep for 1 1/2 to 2 1/2 hours during the day on weekends. He is given only an hour and a half at preschool, but has never once been listed on the dreaded 'No Nap Board'. So yes, it was a big deal yesterday when we were all at a local beachfront park having a late picnic lunch (late because we were busy rearrangeing our living room that morning - Mrs. LIAYF calls it "Cost free decorating") and I mentioned that we needed to get going or Lukas would be napping at 3pm. It was then that Mrs. LIAYF looked over at me and asked if we should just skip the nap, which we did. That decision certainly gave us extra time at the park to explore, walk on logs, throw rocks into the ocean, then leave and treat ourselves to some ice cream before heading home. It turned out to be a fun afternoon. But, by dinner time Lukas was certainly getting pretty slap happy without the extra sleep, and our intention was to get him to bed by 7:30. Well, it ended up being closer to 8:30 and he was wound up enough that he still didn't go right to sleep. Then he has bad dreams not long after he did go to sleep. We're not sure if the bad dreams were a result of not napping, but without one his brain has a lot more day to process all at once, so it could well have contributed. In the end, we all survived our first foray into life without naps. It was a milestone that was due, but we are certainly not planning to have Lukas abandon them altogether since at his age the more sleep he can get the better. But at least this frees us up a bit in the scheduling department. There are a lot of events that happen during the middle of the day on weekends that we have been missing up until now. How about you readers? How old were your kids when they stopped napping? Mrs. LIAYF knows how to put the hammer down! Well the sign will tell you, "Turn if there's a one"
So I hope somewhere that troubles will be gone. It's unbelievable to me, but Lukas is now less tha﻿n a month from his 4th birthday. Time, she is a strange beast, no? Passing ever so slowly in the multiple sublime moments that make up each rotation of the planet - but then, seemingly in the time it takes to wrap your child in your outstretched arms, years have silently slipped past. I find it strange, and also a bit humbling, how certain things that we as parents think we have helped our kids successfully navigate can turn out to be merely developmental stages that we have perhaps just delayed. Take for instance, fear of the dark. From his first few weeks Lukas has slept in his own room, with the door closed and a blackout shade drawn. Save for the glow in the dark stars and planets Mrs. LIAYF and I adorned to his ceiling, his room has always been fairly dark. Thankfully, he has never seemed to mind this and never been afraid of the dark. Until now that is. I was always sure that this was because we had approached this potential issue head on from day one. A couple of nights ago, Lukas opened his door at midnight and told his mother and I that it was too dark in his room, and that he was scared to go back to bed. He had just watched Finding Nemo for the first time, and had been a bit disturbed by some of the shark scenes. But it wasn't just the movie. His imagination has been extremely active recently, with him telling us lots of elaborate stories about ghosts and monsters, and also of dreams - such as the one where 'Bad Guys' came through his window, chasing his mother and I down the stairs before shooting us. Now that his imagination is in overdrive, I suppose it is only natural that he would now be more unsure of what he can't see. So, when he woke up frightened the other night, I just held him in my arms and told him it was ok. That Mommy and Daddy wouldn't let anything bad happen to him. Then I tucked him back under his covers and Mrs. LIAYF and I plugged in some star light above his bed. They were much too bright, so we covered them and called it good as we kissed him goodnight and he went right back to sleep. The next day we bought him his very first night light - a cool Red Rocket. So far, it has done a great job of keeping all the scary things away.